Never call it Parmesen! This was one of the first things they told us when we arrived at Caseificio San Pier Damiani Parmigiano Reggiano dairy in Parma early one morning to see the cheese being made. In our eyes Parmigiano Reggiano was just something that we sprinkled on our Italian pasta dishes, we were about to discover that it can be used in so many more ways. We have to arrive early as the cheese is always made in the morning following the first milking of the day. We were introduced to Mr. Igino Morini from the Parmigiano-Reggiano consortium by our guide a wonderfully passionate Italian lady called Ilaria Bertinelli. 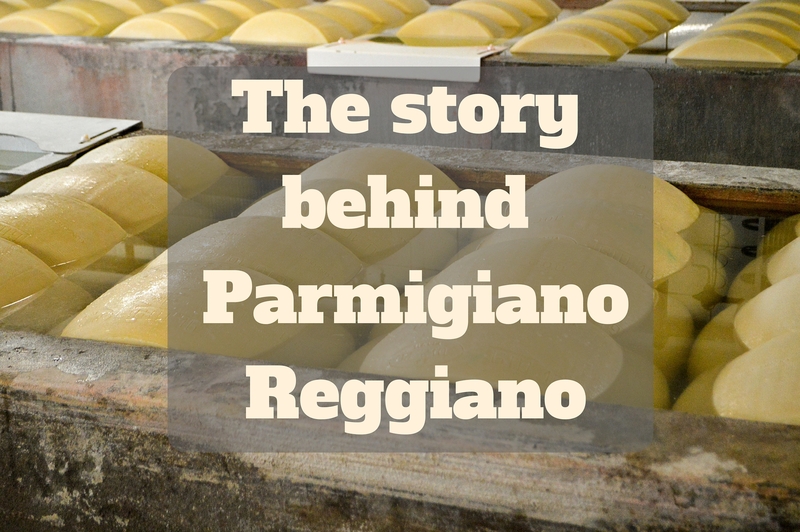 The story of Parmigiano Reggiano cheese be can be traced all the way back to the Middle Ages. First produced by Cistercian monks in the Po Valley, it would be used to help feed travelling pilgrims. Parmigiano Reggiano is like Champagne, in that for Parmigiano Reggiano to be called as such, it must be made in the provinces of Reggio Emilia and Parma, Modena, an area of Bologna on the left bank of the river Reno, or Mantua, on the right bank of the river Po. It will then carry the DOP (Protected Designation of Origin) mark. There are approximately 350 dairies in the consortium however this number is reducing all the time as it’s not very profitable to make Parmigano Reggiano in this tradition artisan way. 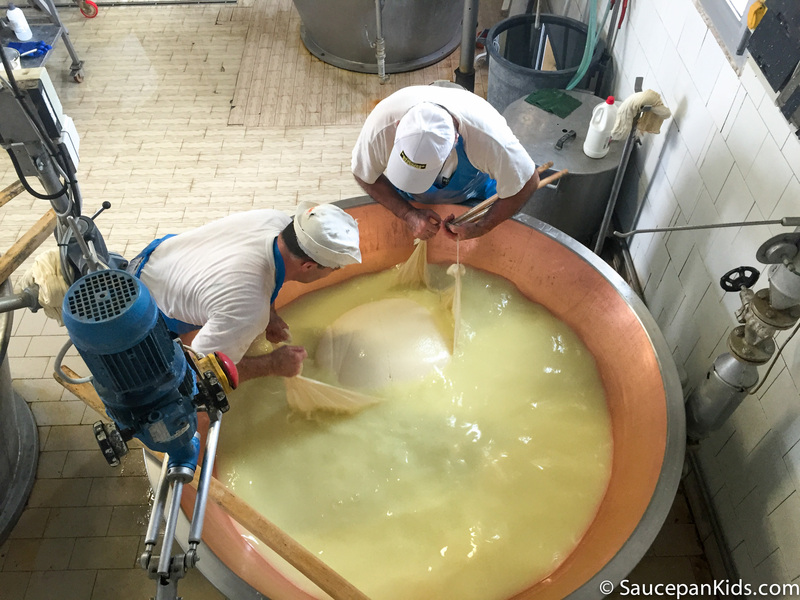 All the wheels of cheese will be monitored as they mature by the Consorzio del Formaggio Parmigiano Reggiano, who are the official organisation in charge of ensuring a quality product and who award certification. 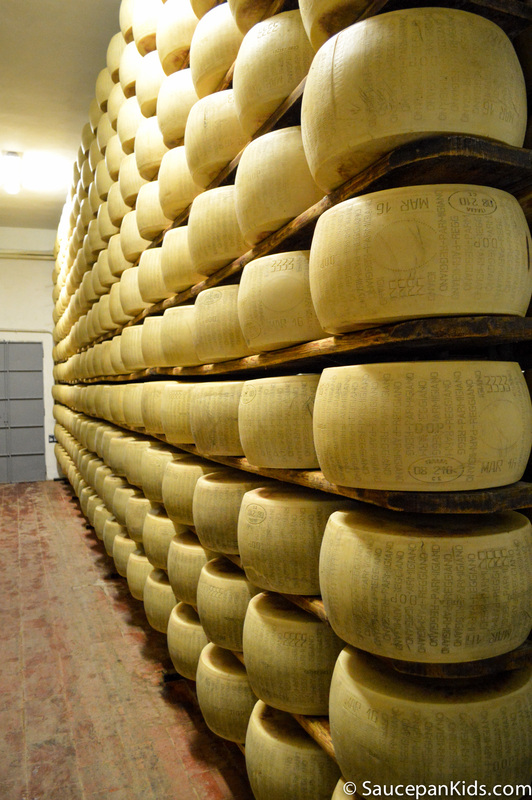 Parmigiano Reggiano is a physically demanding artisan food product to make and a fascinating process to watch. 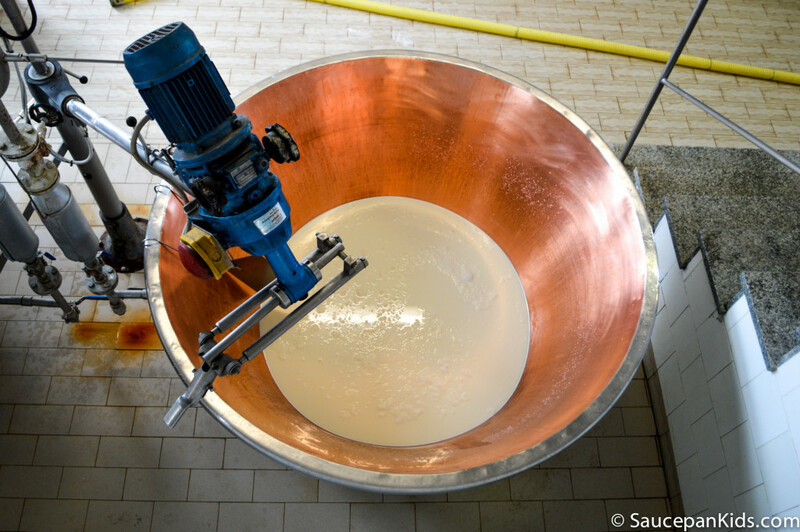 It takes 550 litres of milk to make one wheel of cheese! 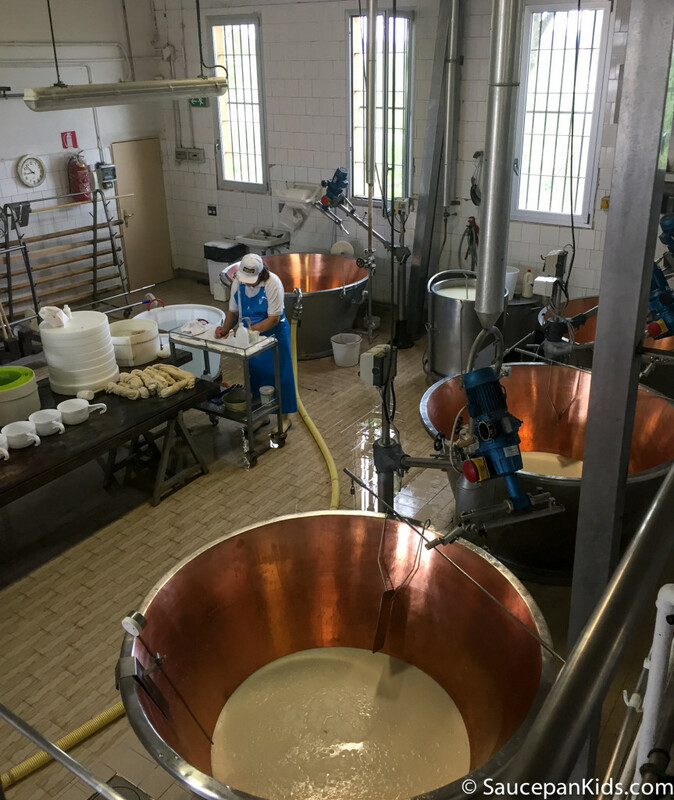 Nothing is wasted, leftover whey is used to make ricotta and to feed pigs (mixed with cereals) which will then be used for Parma ham, helping give them their flavour. The leftover whey is also often used by people who are recovering from broken or injured limbs. The kids were really taken with one of the tools they use called a spino which looks like a giant whisk. The master cheese maker uses it to break up the curd. Interestingly, spino means thorn as they originally used hawthorn branches for this part of the process. 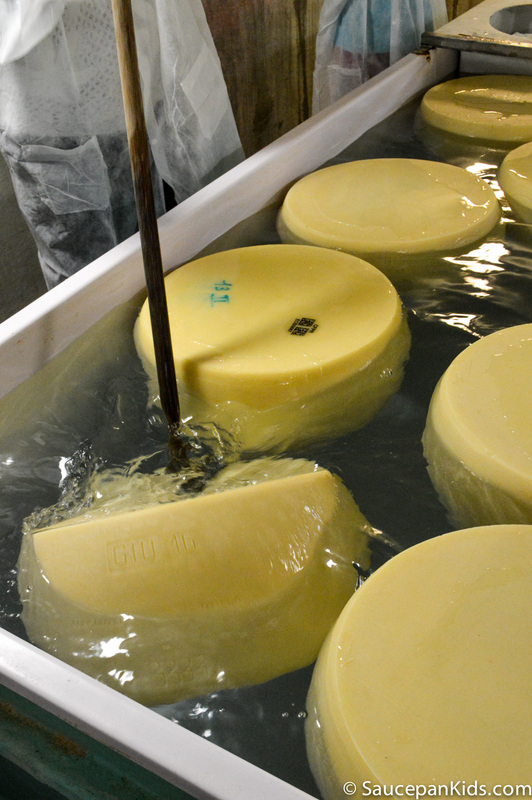 Each wheel of cheese is wrapped in a matrix whose dots stamps the cheese with the month of production and the makers unique number proving its authenticity. After this the cheese is submerged in brine (the water is completely saturated with sea-salt). The salt enters the cheese by osmosis but also helps create the crust on the outside. During this time the cheeses are regularly turned. Having been in the brine for (10) days the cheese is then moved the the maturation room. 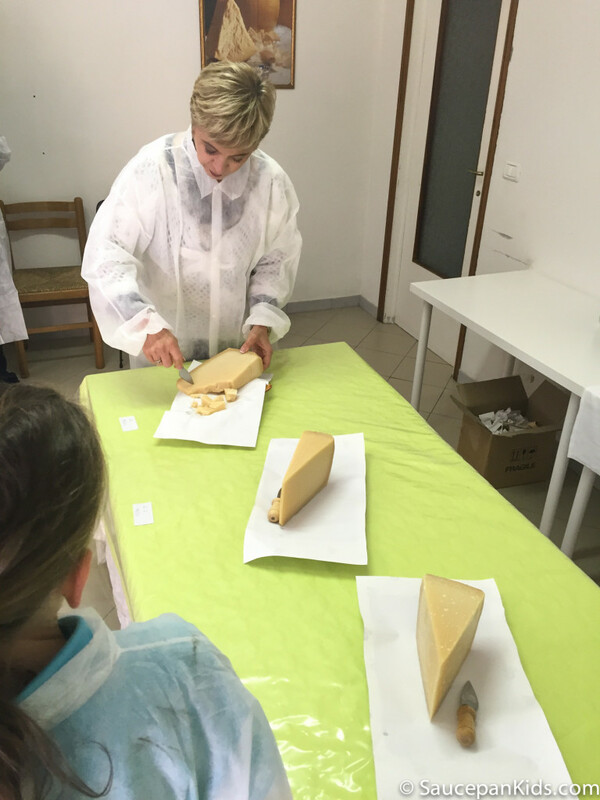 The cheeses are matured for either 12, 22 or 40 months. During this time, each wheel will be checked by a member of the consortium. This is done by tapping the outside of the wheel with a special little hammer. They are listening for a sound that will indicate if there are any imperfections in the cheese. They can identify any problems from the sound. If imperfections are detected then the cheese will be sold off young to the mass production market to be reprocessed. 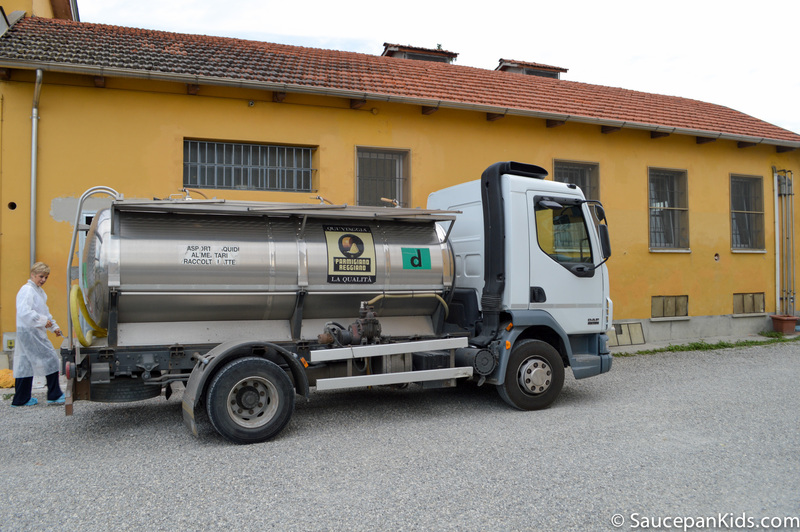 This particular dairy export 30% of their end product outside of Italy to France, Germany, USA and UK. 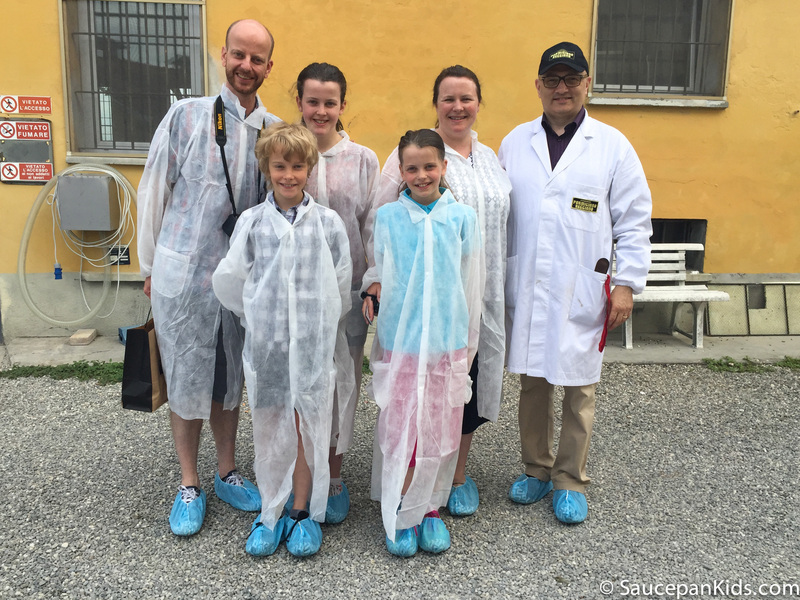 At the end of our tour, we had the opportunity to try some 12 month, 22 months and 40 month old Parmagiano Reggiano cheese. I have to say the 40 month old was strong but an incredible taste. I loved the fact that you could taste the crystals. It’s a little known fact that mature Parmagiano Reggiano is actually a very healthy cheese, so low in lactose that it’s suitable for those people who are lactose intolerant, it’s high in calcium and easily digestible. 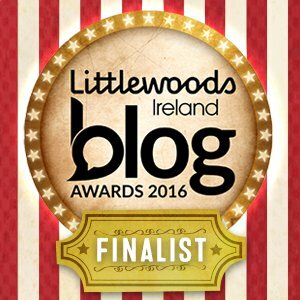 One lady we spoke to admitted that when she has a tummy bug then Parmigano Reggiano is the only food she will eat while she recovers. She also told us that Italians often give it to babies mixed with rice flour and vegetable stock when they are being weaned. We now feel inspired to use Parmigiano Reggiano in new ways. We tasted it with some good quality balsamic vinegar sprinkled over the top and it was one of the most delicious things we’d ever tasted. 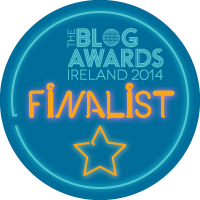 Instead of being just an after thought, we will now celebrate Parmigiano Reggiano as the king of cheese it is. 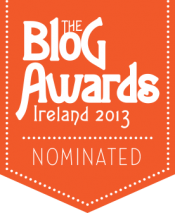 Do you like to cook with Parmigano Reggiano at home? Disclaimer – Thank you to the Emilia-Romagna Tourist Board for providing us with this tour for the purpose of this review. This review is, as always, 100% honest and our own opinion.